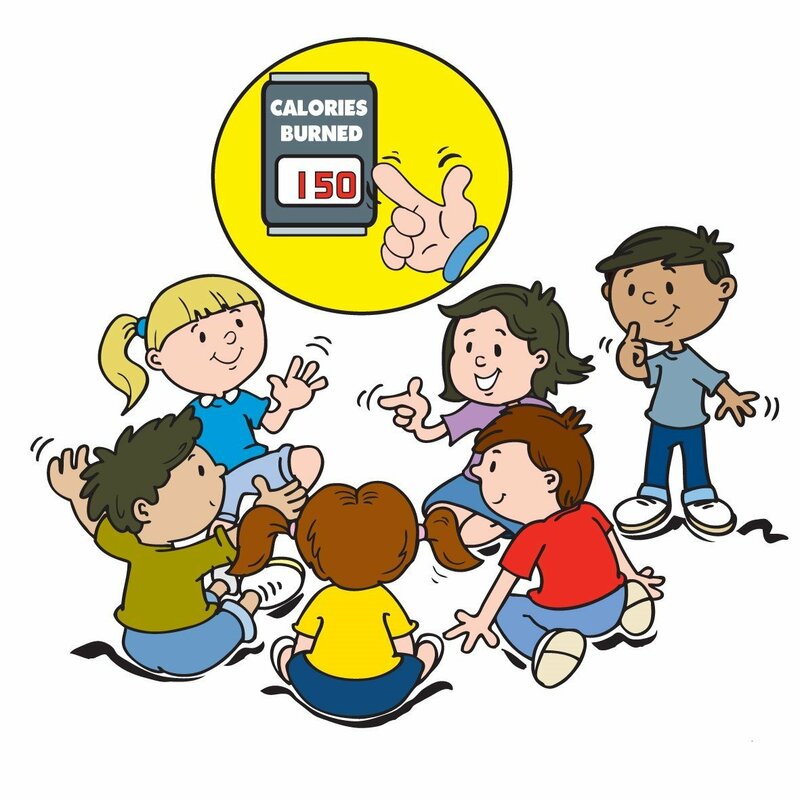 Hide the console, stick the smart phone in a drawer, and distract the kids with these fun, calorie-burning games that'll get them moving even if it's too dark to play with outdoor toys. As the nights draw in, parents' attitudes towards children's technology usage may differ and kids will probably want to spend their evenings relaxing in front of the TV or snuggling up with their consoles. 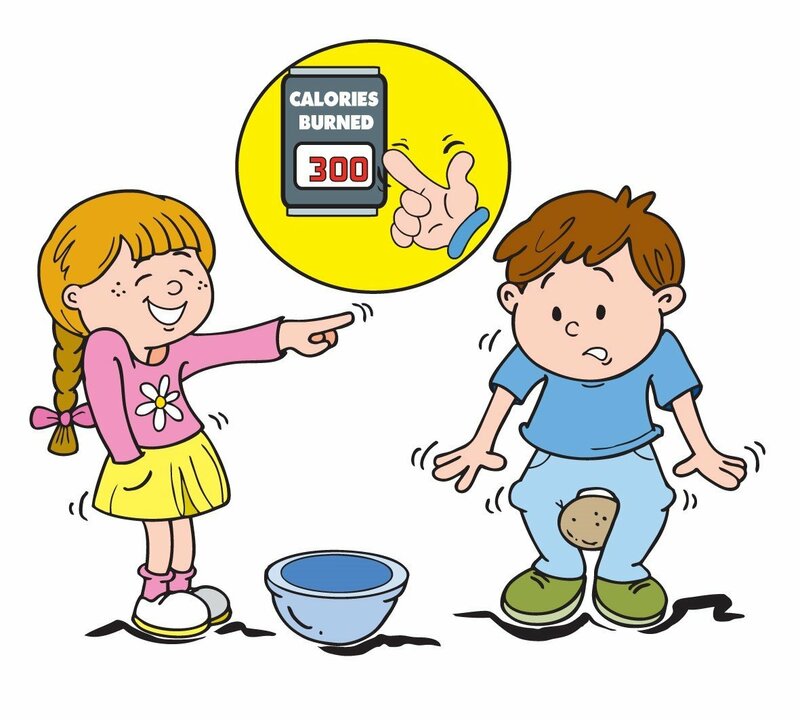 But the latest statistics from The National Child Measurement Programme (NCMP) show that more primary school children are seriously overweight than ever – almost 10% of Year Ones, and 20% of Year Sixes are now classed as obese! As obese children are more likely to become obese adults, and have an increased risk of high blood pressure and cholesterol, type 2 diabetes, breathing problems, joint problems, and musco-skeletal discomfort, it's time to hide the consoles! 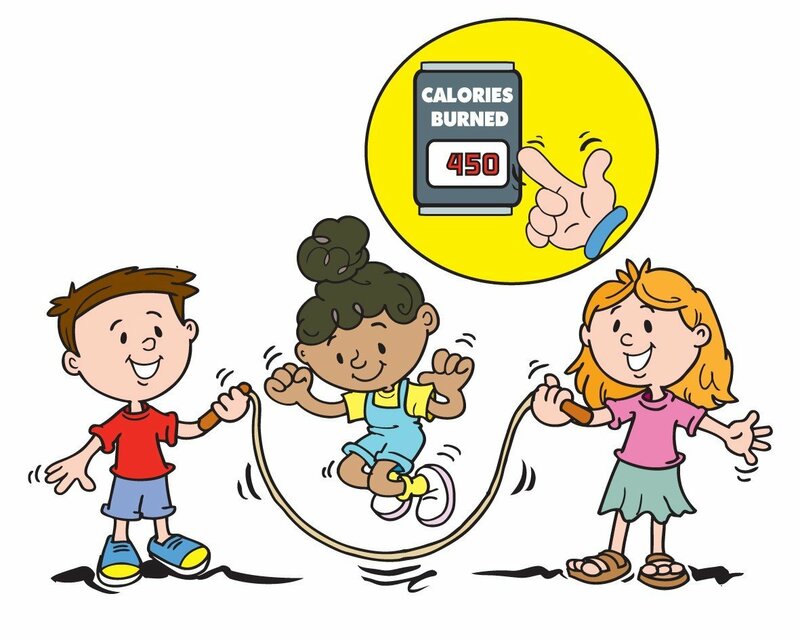 Our increasingly sedentary lifestyles are thought to be a major factor in childhood obesity, so it's important to keep kids active and that doesn't have to involve buying a shockingly expensive children's toy. How to play: The aim is for each player/team to be the first to pot all their coloured balls and then the black, using the pool cues. The twist is that you can't hit the balls directly, but have to strike them with the white ball - which sounds complicated, but isn't! Set the coloured balls and black up on the game table using a D-ring (you should get one supplied with your pool table – there are various ways you can set the balls up inside them, but the black always goes in the middle). Pick a colour each, then take it in turns to use the white ball to pot your colour. You can keep playing so long as you pot one of your balls each time. If you don't pot anything, it's the other player's turn. If you accidentally pot the white or black ball, or one of your opponent's balls, the other player gets two shots. Fitness goals achieved: There's a surprising amount of walking – a 2-hour session typically involves more than 100 walks round the table. It's good for stretching, particularly in the upper body, balancing, improves hand-eye coordination and – as it's tactical – sharpens the mind. You will need: Several players and a house with a few decent hiding places! How to play: One player hides, and the others try to find them. The first one to do so wins. Fitness goals achieved: As a large part of this game involves remaining completely stationary, this isn't the cardio workout that some kids' games provide! 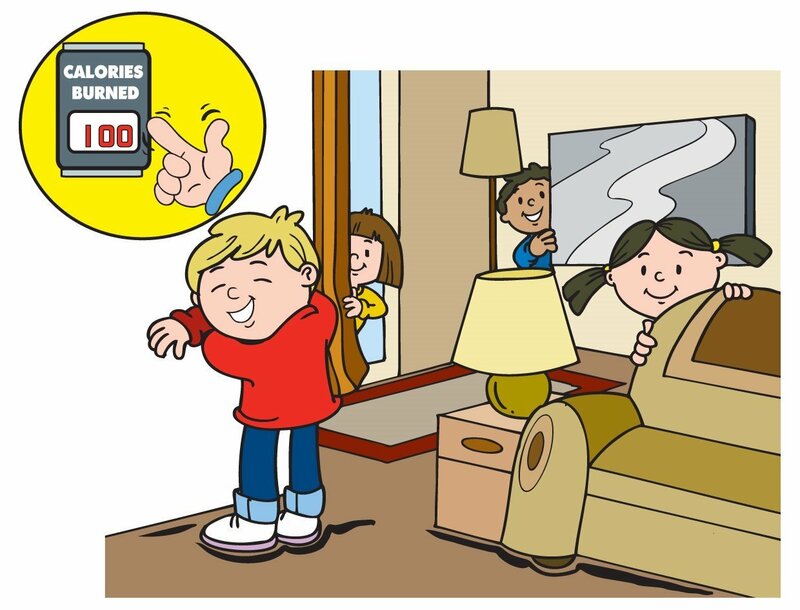 However, it does involve some walking, often up and down stairs, helping to keep heart rates up and children active! You will need: The board and spinner, two or three players, and a referee. How to play: The referee spins the spinner and calls out a body part and colour. All the players then have to try and put the appropriate body part on the appropriate colour – if they are already on this colour, they have to move. Players are eliminated for falling over, or for touching the mat with a knee or elbow. The winner is the last man (or woman) standing. A great party game and for fun family nights as well. Fitness goals achieved: The suppler and more flexible you are, the better you can perform in Twister! You will need: Players and chairs – the more of both, the merrier, but always one fewer chair than players! You also need a referee to do the music. Use your portable speaker to play this game on the go! How to play: Arrange the chairs in a line in the middle of the room, some of them back-to-back. The players dance round them while the music is playing. When the music stops, all the players sit on a chair – one per person, and the player left standing each time is out. A chair is removed each time play resumes, until there is one player and no chairs left! 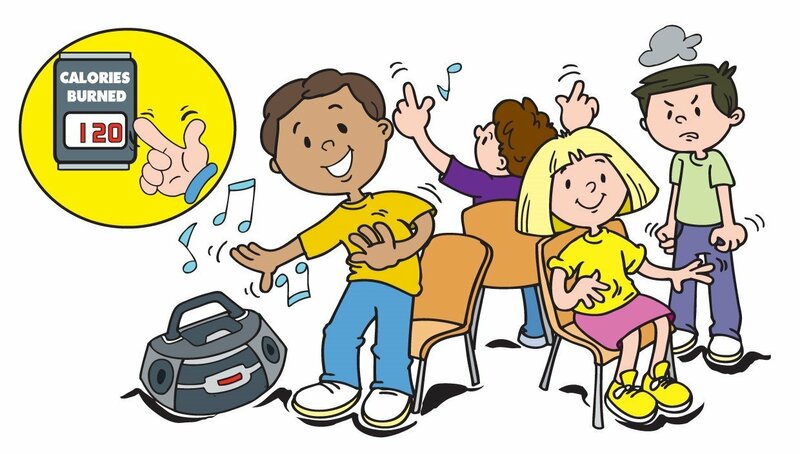 Fitness goals achieved: Dancing burns calories and increases muscular strength, endurance and motor fitness. It also improves flexibility and is low impact so it doesn't put stress on the joints – unless you throw some particularly wild moves, of course! 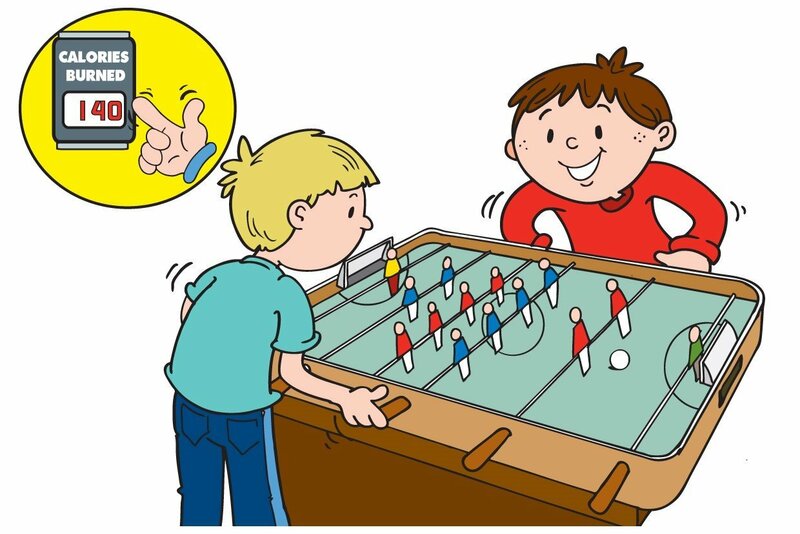 You will need: A foosball table, ball and two or four players. How to play: There are two teams of footballers facing each other, each of which is controlled by four handles, enabling them to move side to side, kick and block. The object is to use your men to score more goals than your opponent(s). Remember: you're not allowed to spin the players! Fitness goals achieved: You don't move your feet much during foosball, but your upper body, particularly your quads and biceps, get a workout. It also helps with hand-eye coordination and improving mental acuity. You will need: A ping-pong table, bats and balls. Two or four players. How to play: Start by serving – the ball must bounce on the server's side of the table before going over the net and bouncing again on their opponent's side. 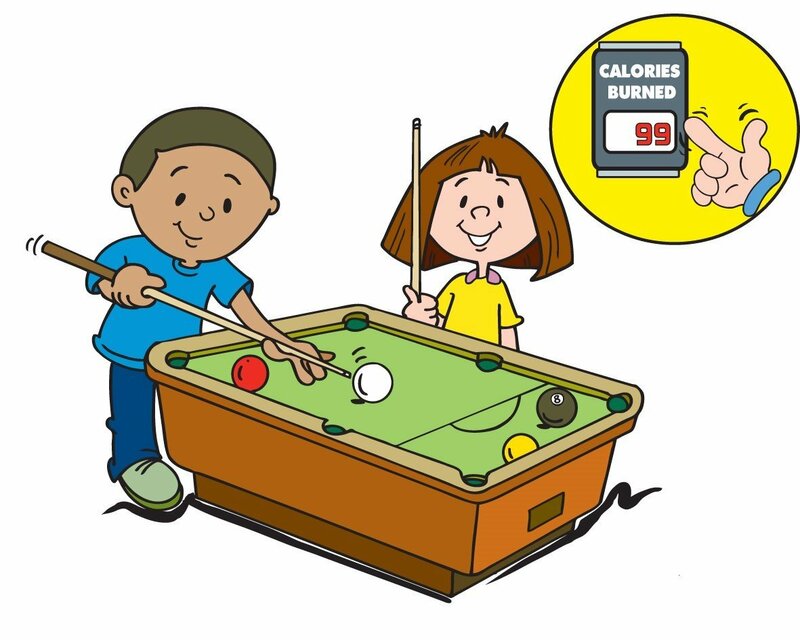 The ball must be returned before it bounces twice or hits any object off the table, or the floor. The ball remains in play until someone misses, or mishits, and a point is then awarded to their opponent. Most people play to 15 or 21 points, alternating the server every five points. 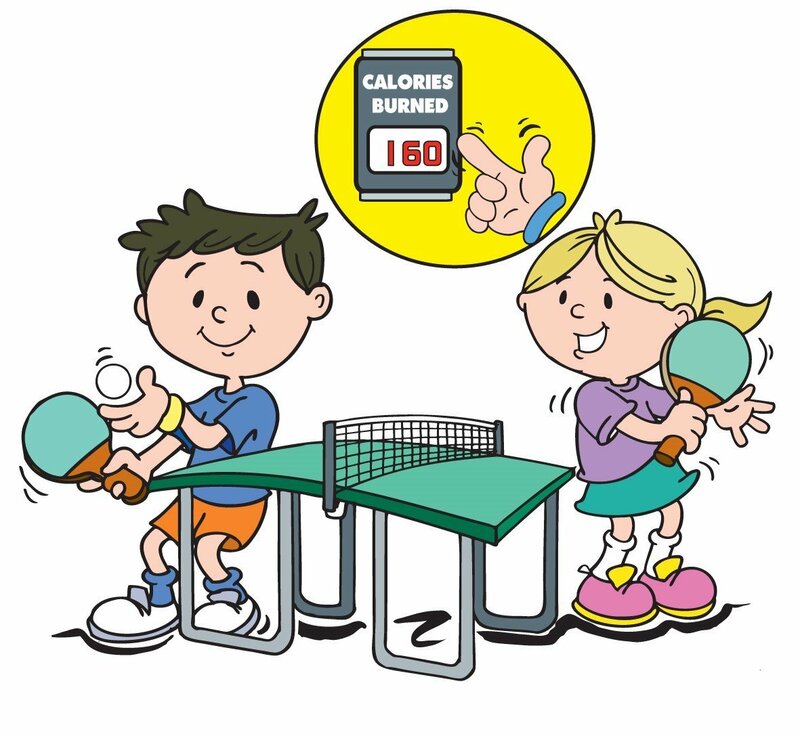 Fitness goals achieved: There are loads of benefits from a fast and furious game of ping-pong – you may be moving within a small space, but you move a lot! It's great for hand-eye coordination, improving balance and reflexes, and its positive effects are even said to include improving cognitive awareness amongst dementia sufferers! You will need: A few players and a camera to capture the fun! How to play: Sit in a circle facing inwards. The 'picker' walks round the outside of the circle, tapping each player and saying 'duck' before finally naming one 'goose.' That player jumps up and tries to touch or tag them as they run round the circle to take the goose's place. If the goose does not succeed in tagging the picker, they become the picker instead and the game resumes. Fitness goals achieved: Although the game involves a lot of sitting, with periods of intense running, it's good for getting the heart rate up, and sharpening reflexes. You will need: A bag of potatoes, some bowls, and two or more players. How to play: Each player places a potato between their knees. The aim is to race the other player across the room and successfully drop the potato into the bowl. If they touch the potato with their hands or drop it, they have to return to the start line and begin again. Fitness goals achieved: A good general cardio workout, this tones leg muscles and helps improve balance and stability. You will need: A hula hoop! How to play: Stand with your feet hip-width apart. Place the hoop round your waist, held against the small of your back. Give it a vigorous spin, and move your hips energetically from side to side to keep it twirling round your waist. Make sure you hold your hands out of the way – and change the direction of the hoop regularly so you exercise equally on both sides. If there are two or more of you playing this, the one who can keep the hoop spinning the longest is the winner! 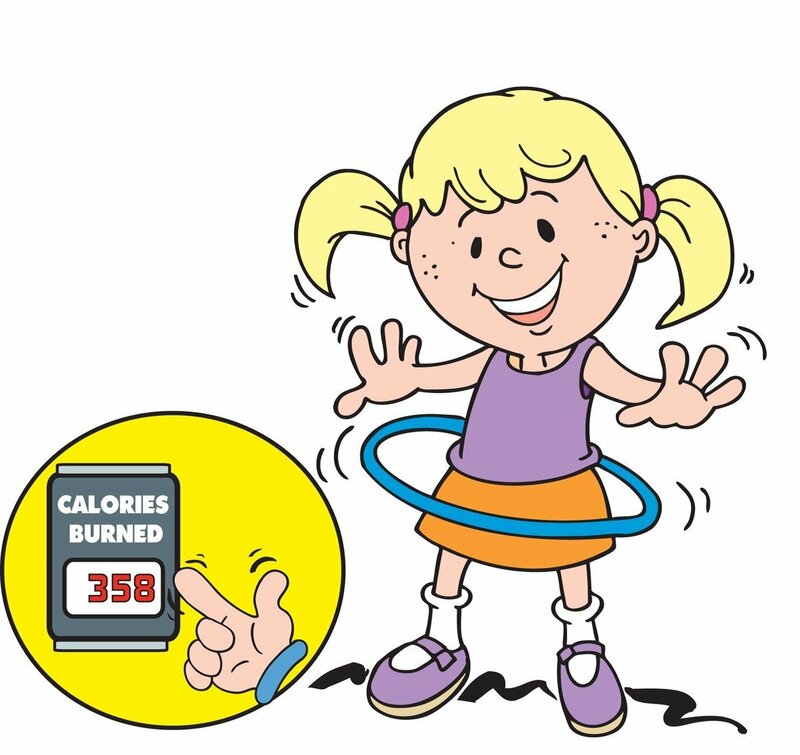 Fitness goals achieved: Hula-hooping works your core muscles, toning your back, abs and obliques and improving joint flexibility and stability. It also provides a good cardio workout if done over a sustained period. Just 10 minutes of hula hooping a day can knock centimetres off your waistline – Michelle Obama and Beyonce are amongst its celebrity fans. You will need: Skipping rope, one or three players. How to play: You can do this alone, simply twirling the rope over your head and jumping it as it comes round each time. Or you can play with a longer rope, held by a person each end who twirls it in time, while the third player stands in the middle and jumps the rope. Once you've mastered it, you can vary the speed and direction, or add another rope for 'Double Dutch' – play around and have fun! Fitness goals achieved: Skipping for an hour provides a very effective cardio workout. It improves stamina and flexibility, and is particularly good for toning hips, thighs and bottoms!